Though there are hundreds of Greek Islands, most people know of only a handful and have only visited a few of these. Islands such as Santorini, Mykonos, Crete, and Ios have become synonymous with the Greek Mediterranean and continue to be staples in Greek tourism. 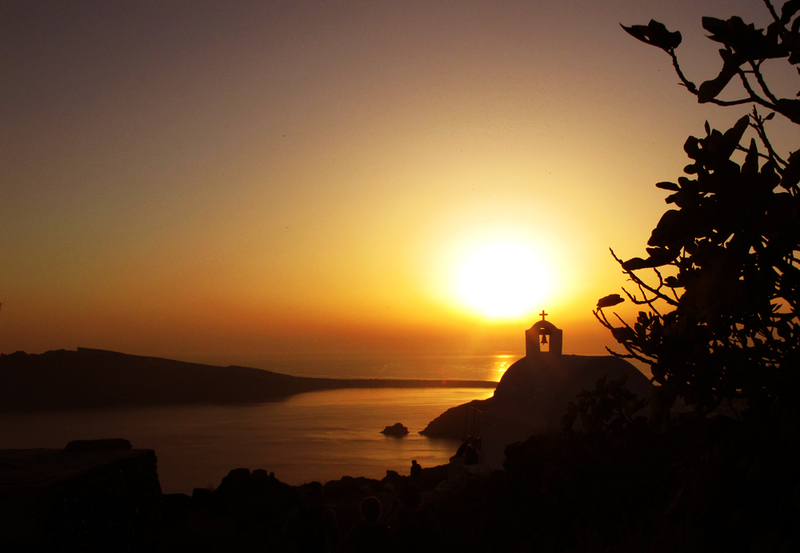 The famous sunsets and blue-domed churches of Santorini should really not be missed. Nor should the iconic windmills and winding streets of Mykonos. However, they have become so popular with tourists and cruise lines that the relaxing island experience which used to lure us to these places is now dwindling. Even in shoulder season the islands are packed with people all there to soak in the Greek sun and island culture. 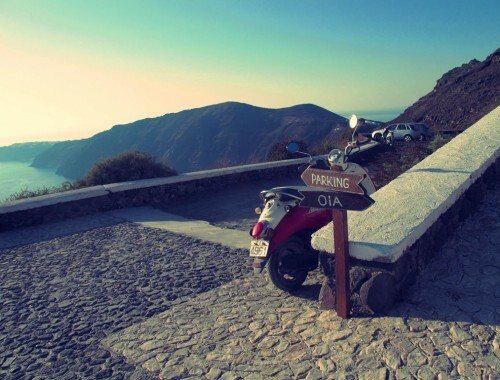 The Greek sun, however is the reason alot of people travel to the islands. Thus visiting in off season isn’t a favorite option. But luckily, not too far from these famous islands are some less famous islands. 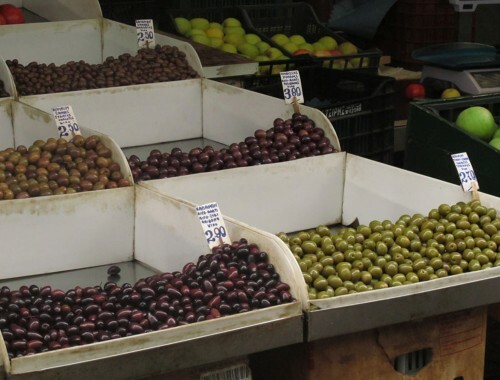 They are equally (though uniquely) beautiful and offer even more of the Greek Mediterranean experience with far less people. And still offer that sense of island calm that can be missing amongst other islands. 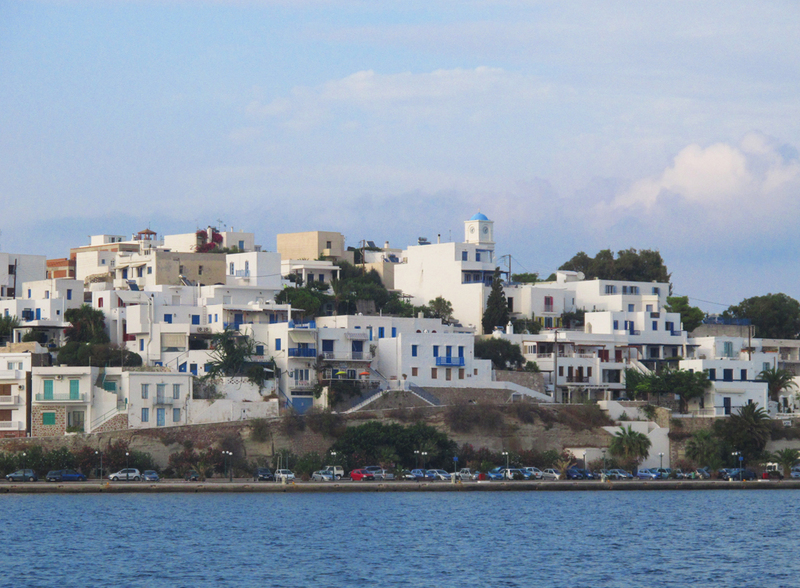 One of these places is Milos. Though its claim to fame is the statue of Venus de Milo, its lunar-like volcanic landscape is what stole my heart. 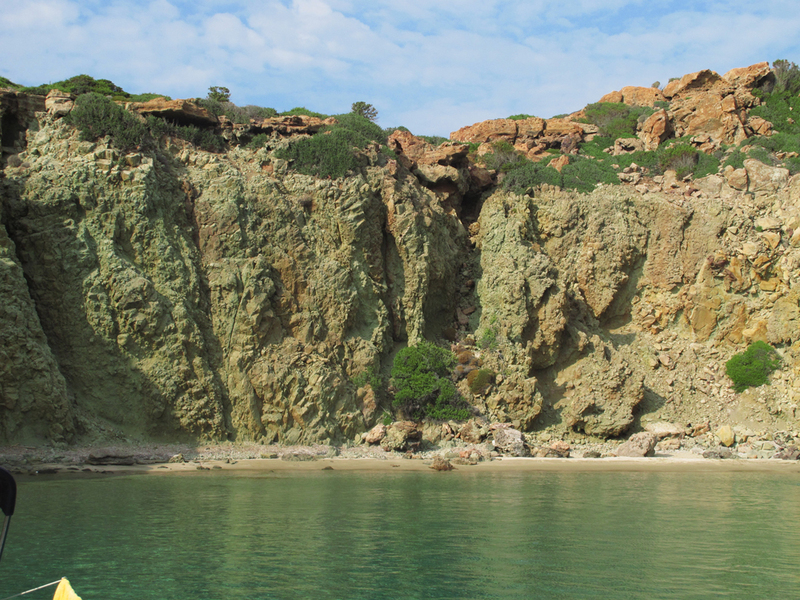 Colorful cliffs, rainbow sand beaches, and interesting rock formations are all what set Milos apart. Unlike other Mediterranean islands, the water fringing Milos tends to be more turquoise in contrast to the iconic blue of most others. The towns are small and hotel options are limited, which keeps the crowds manageable and space abundant. 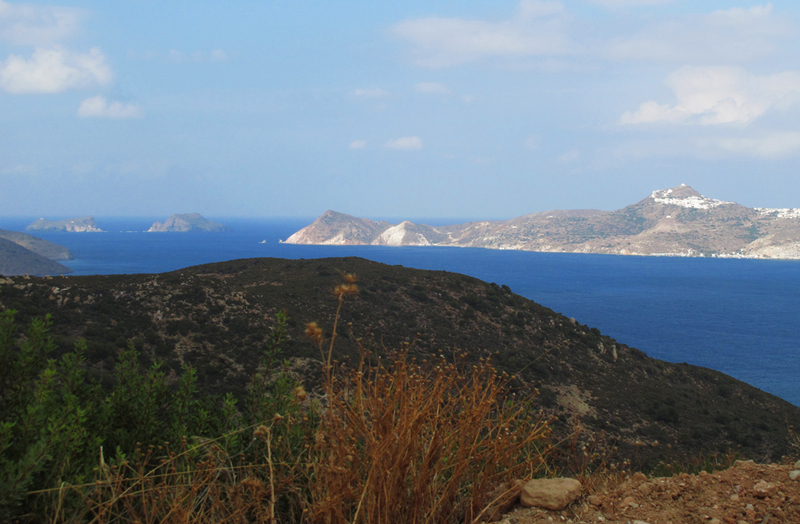 Nature is what made Milos a favorite for me, as it is different than any other island I ‘ve ever visited. 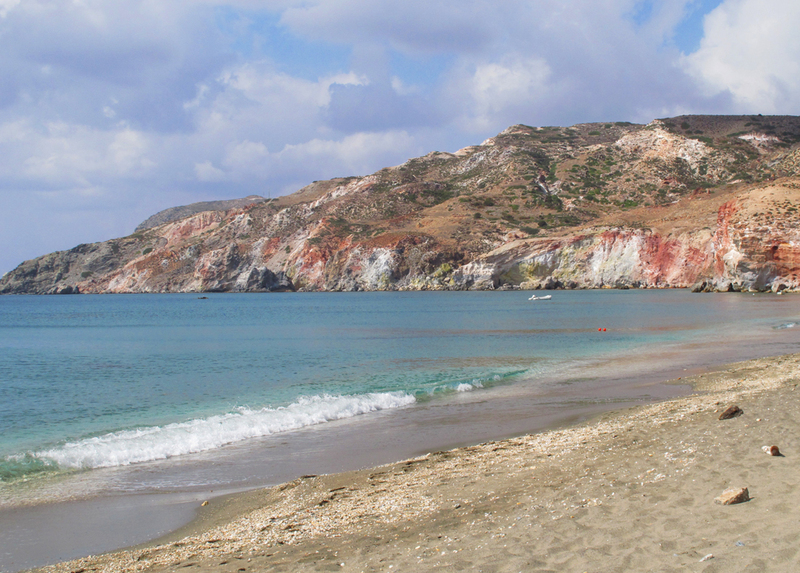 A visit to Milos wouldn’t be complete without a day spent hopping around the island’s beaches. 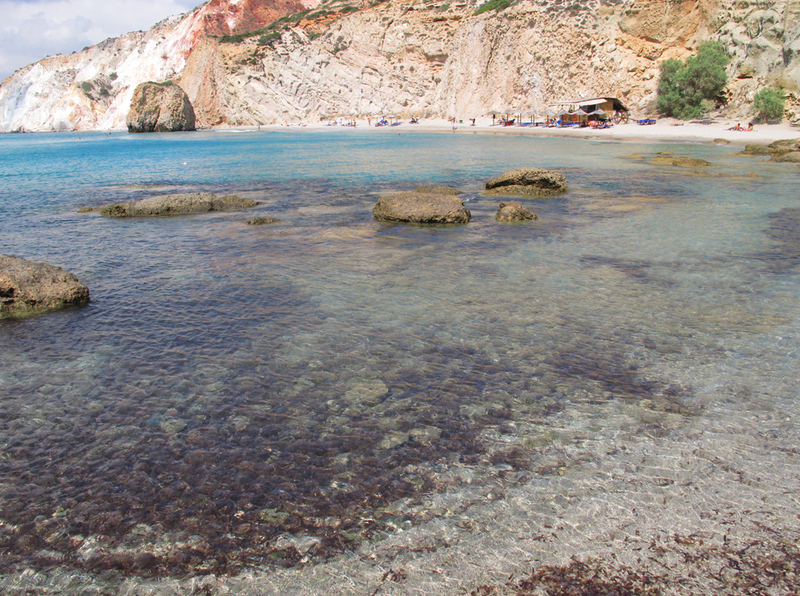 A shallow bay with bright turquoise water surrounded by cliffs of red and white rock. South Shore. A long stretch of rainbow sand flanked by tall colorful cliffs. Good for swimming and snorkeling. South Shore. An eroded smooth white rock beach. The beach itself is very small, but the water is protected on a calm day by walls of shockingly smooth rock. It’s like another planet. Seriously. North Shore. A rugged rocky inlet with a tiny beach but beautiful jagged cliffs on either side. North Shore. 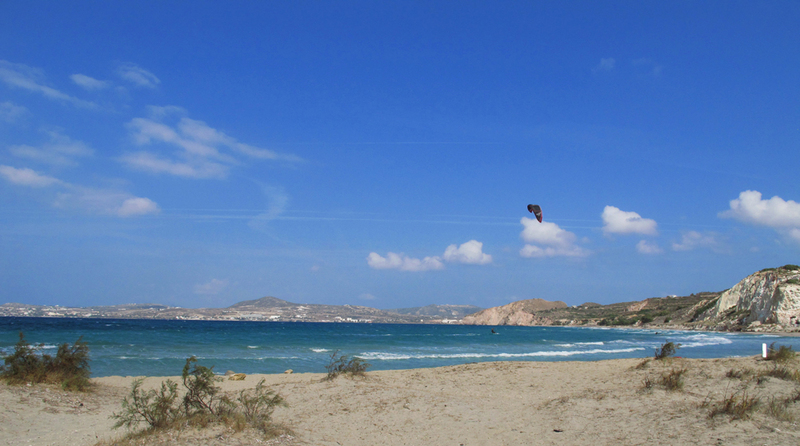 It’s right in the main bay by the port, and on a windy day it’s a good place to watch kiteboarders. In Milos Bay. 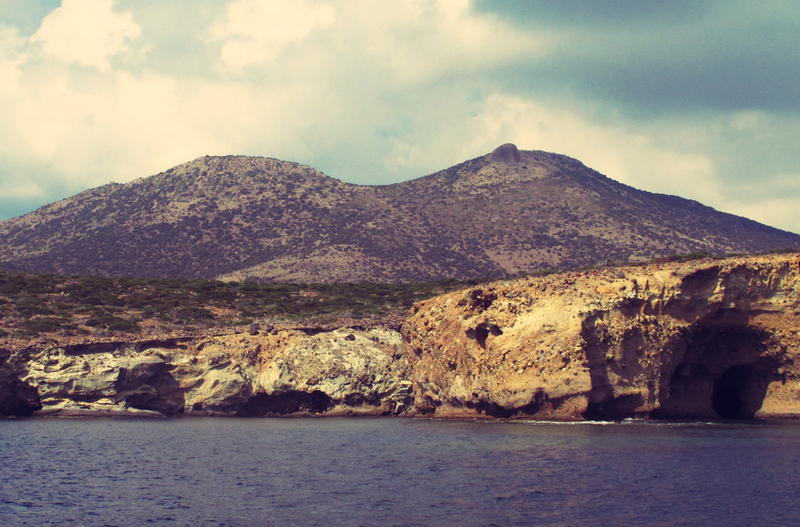 Another must-do activity is a sailing trip around the island to visit the caves and rock aches that are only accessible by water. Sikia cave and Kleftiko are breathtaking. Both are defined by specific rock formations. 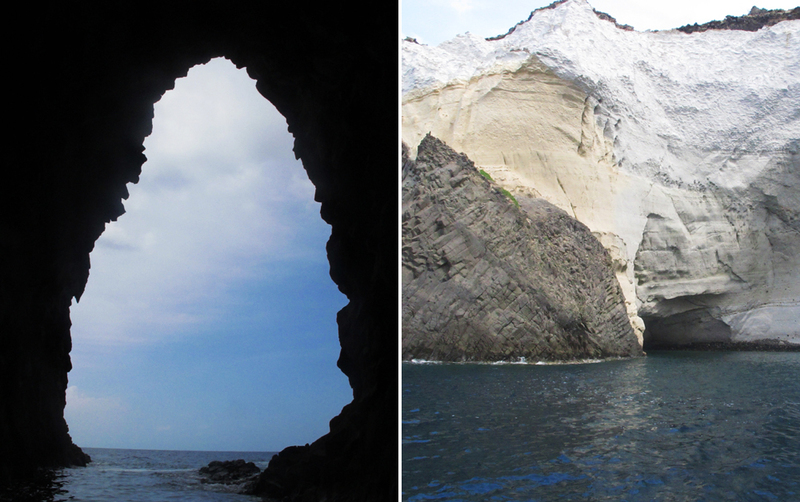 Sikia is a series of archways and caves built into the island’s coast. 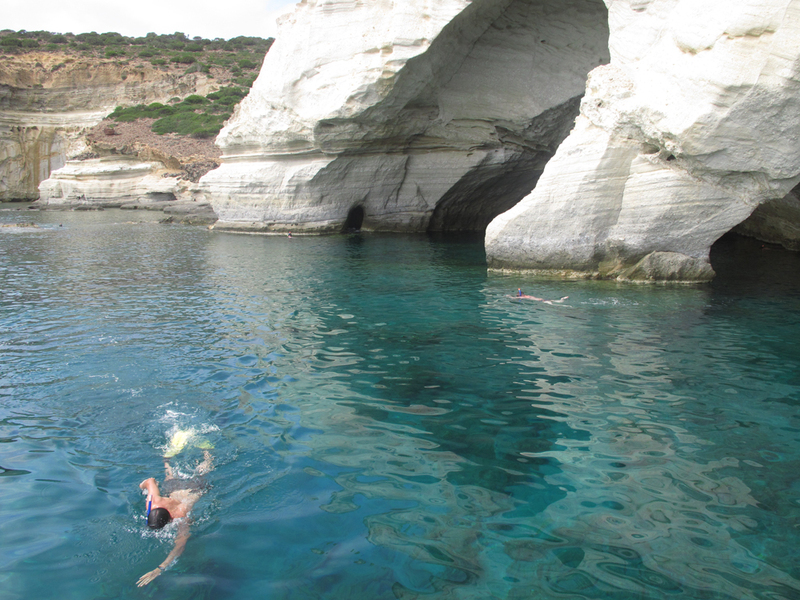 Kleftiko is known for a standalone archway off the coast of underwater caves. In both spots you can snorkel in crystal clear water and swim past brightly colored volcanic mineral deposits and volcanic vents. On the ride down the west coast, you pass the beautifully colored mountains and eroded rocky outcrops. It is all stunning and the little beaches you sail past are tempting for a quick swim and sunbath. As the only way to access either Sikia or Kleftiko is my sea, the sailing trip is the best way to get there unless you have your own boat. Each evening at the dock in Adamas (the main port town), captains will tie up their boats and be available to help you pick a cruise. There are plenty of boats and captains to choose from, so instead of booking in advance, you can shop around and decide which sailboat speaks to you. But at the end of each day, the same sun that sets by Mykonos and by Santorini, sets by Milos. You’ll still sit down to a dinner of meze and delicious Greek specialties. The wine and ouzo will still flow. You’ll just have to share it with a lot less people on an island full of Greek beauty, alien landscape, and warm sunlight. 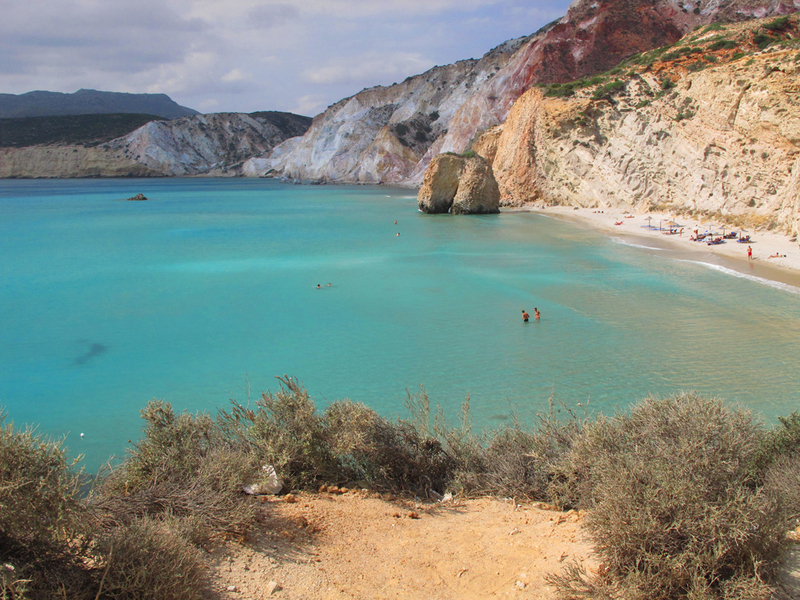 Excellent review of my native island of Milos. Thank you! 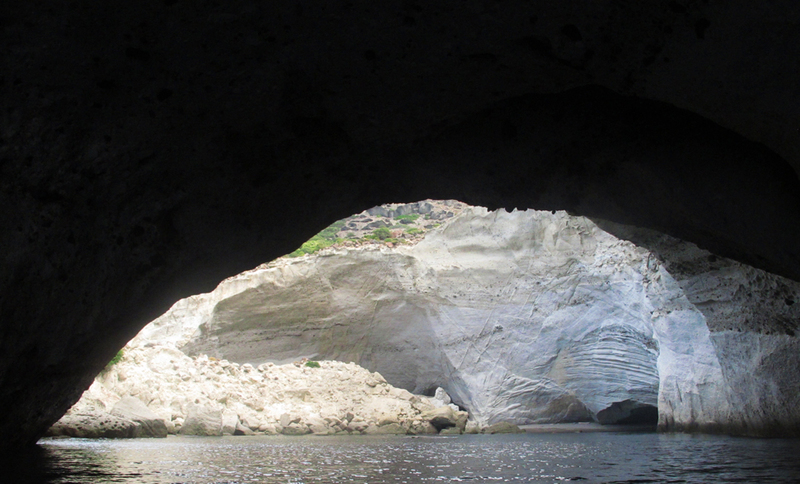 For the benefit of those readers of yours who may be looking to spend their vacation in Milos, there is a Milos Island portal I have created to help them find lodging and other information. It’s nice to see praise for your site coming from Andreas. 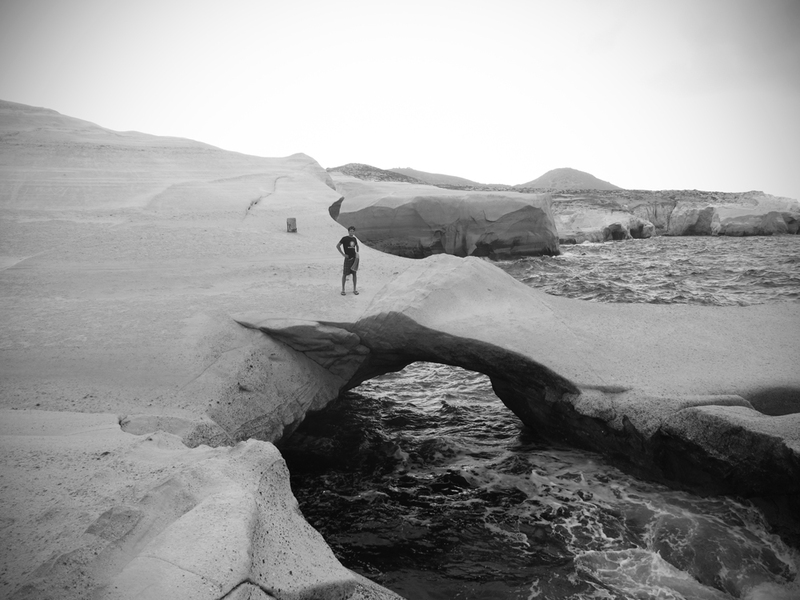 He has taken many wonderful photographs of Milos and does a tremendous amount of work to promote his native island. I have really enjoyed your site. More than ever, now,it is on my list of “must see” Greek islands. 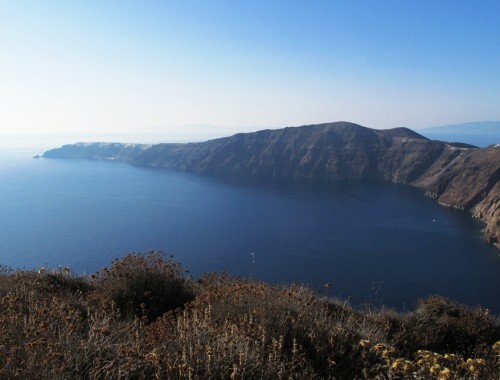 Best wishes, Frank Wood, NW England, regular traveller to Greek islands – particularly Lesvos. thank you! 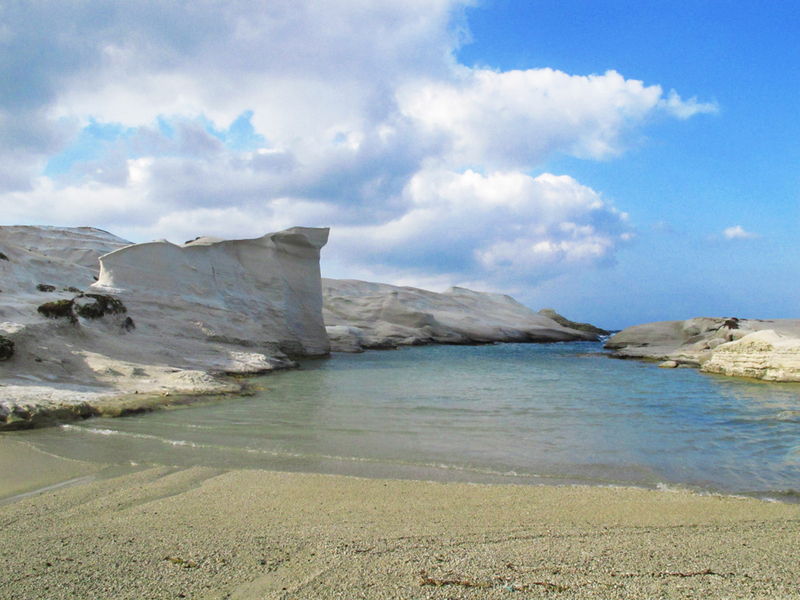 Milos is a beautiful island and deserves beautiful photos. It was one of my favorites.